It’s the end of the year and it’s time to summarise what we’ve heard in 2015! Luckily Spotify has an unique way to tell us what kind of music we’ve been listening too all year long. It’s called Spotify Year in Music. Because some of the result might not be accurate, I compare the result from Spotify and Last.Fm together. I realized I need to do this when I saw Marina and The Diamonds nowhere in any category. And it makes me want to break some heart! 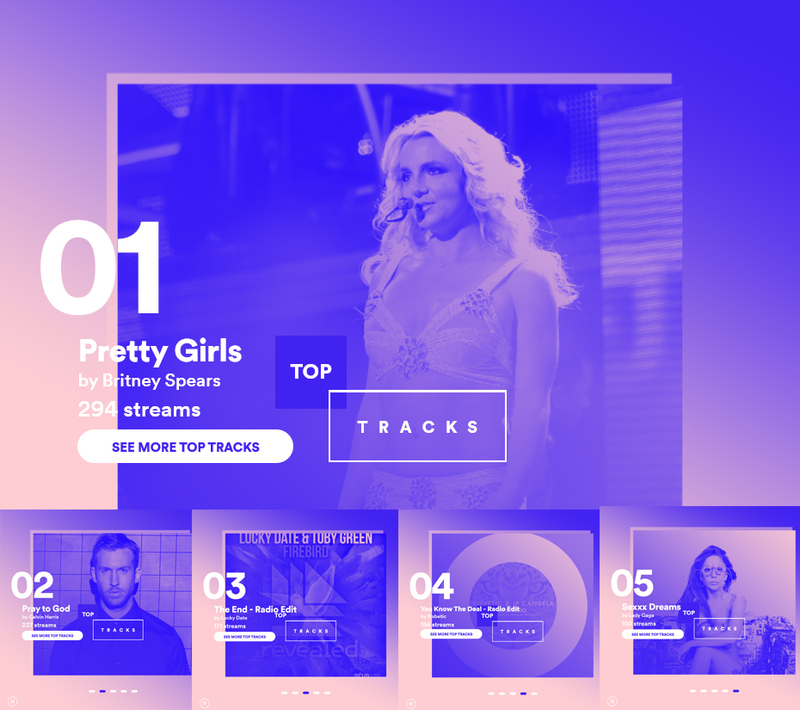 So, let’s check my Spotify Year in Music 2015! I kicked my year off with Slappin’ Da Bass – Original Edit by Reboost. It’s such a good EDM song. Very light and catchy. And no, it has no vocal. But it’s still great! My top artist goes to…. Zedd. And yes, I didn’t predict him. I thought Marina or Britney will be my top artist this year. No, actually I was really sure Marina will be my top artist because FROOT was released in early 2015 and I was obsessed with being a Heartbreaker in late 2015. 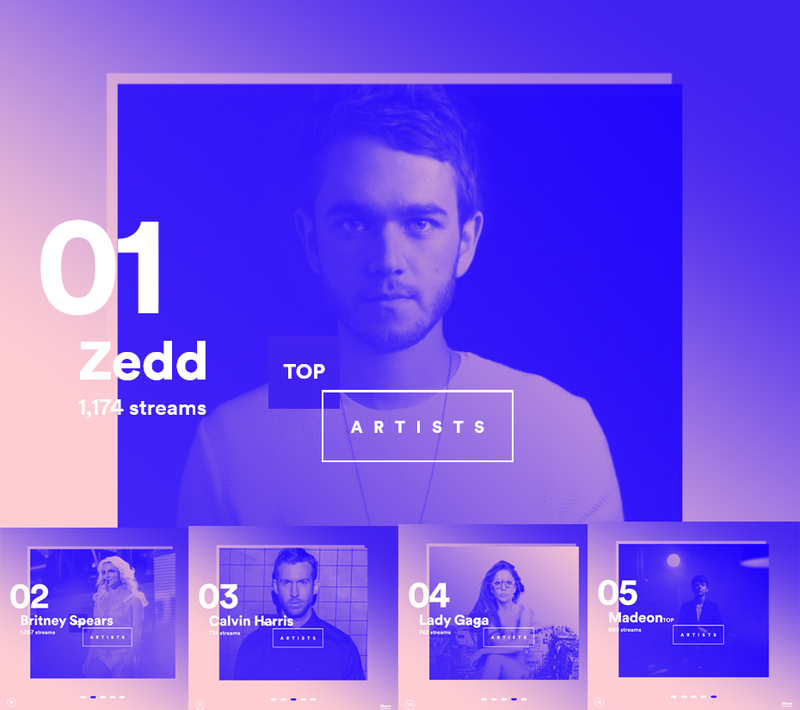 According to Spotify I’ve streamed Zedd 1174 times this year. But according to Last.FM my top artist this year is BRITNEY SPEARS! The one and only legend of this generation, y’ll! I’ve streamed her 1280 times this year. Congrats to Calvin Harris. After I mocked the album in front of my ex about how basic the album was, I finally found some lights in a song like Pray To God, Outside, Dollar Signs, and Together. Followed by Madeon’s debut album Adventure. Third place is owned by In The Lonely Hour and I was like, really? This can’t be right. I only listened to that album twice or thrice in a row. But maybe because I overplayed Like I Can. But whatever. DeJa Vu by Giorgio Moroder is in the 4th place. And most of the streams come from Tom’s Diner I’m sure. But you know, it is really a good album. They just wrongly picked the single. Tom’s Diner should have been the first or at least made it a single the day it leaked. And Clarity is next. So unpredictable. Seems like I haven’t moved on from the past, have I? Thank God I still have Last.Fm to count for. According to this site. My top album this year is: FROOT. Yas!!!! 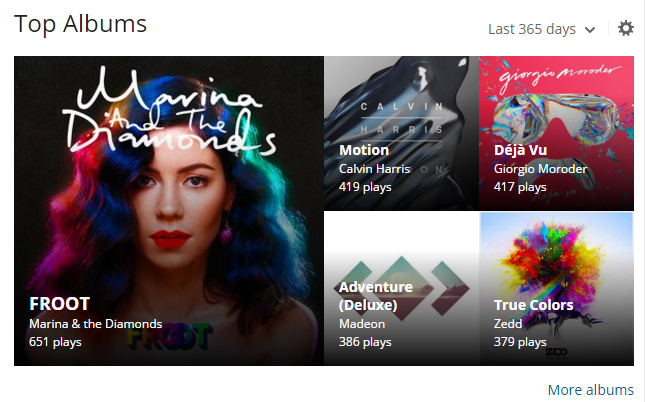 The other top albums are pretty like from Spotify: Motion, DeJa Vu, Adventure, and the last one True Colors. See? No Sam Smith! Pretty Flops Girls. I screamed when I saw the result, like what the heck. It must be because the song is so short that I didn’t realize I have streamed it 294 times. Pretty Girls is followed by Pray To God, The End, You Know The Deal, and Sexxx Dreams. And according to LastFM my top tracks are: Pray To God, I Want You To Know, The End, Pretty Girls, and Can’t Pin Me Down. This one looks more realistic I think. 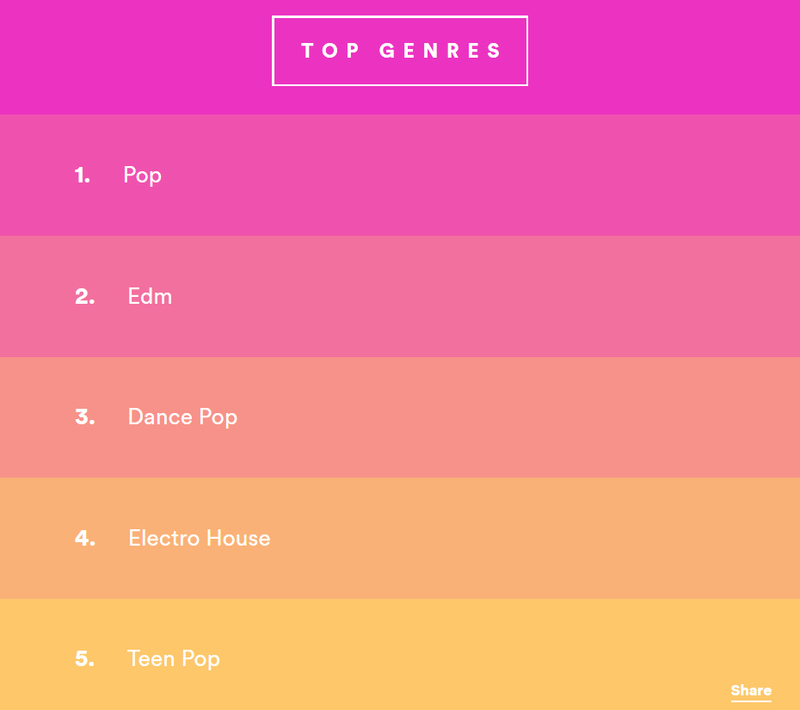 My top 5 genres are: Pop, EDM, Dance Pop, Electro House, and…. Teen Pop. It must be Britney’s early songs. 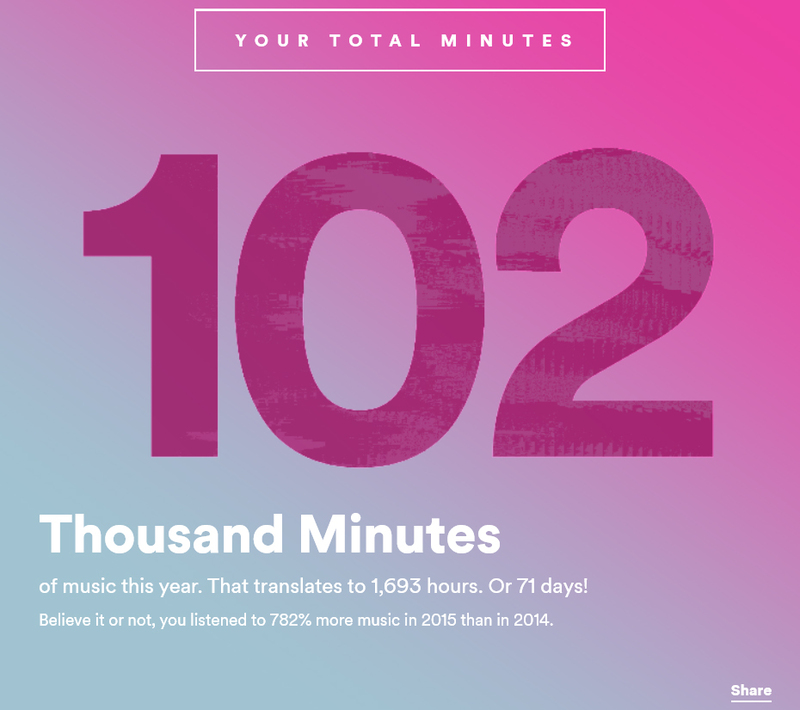 And I’ve spent about 102 thousand minutes of music this year. And I know I have spent more than that because Spotify nor Last.Fm can’t track what I listened to when I listened to songs from my 3DS or Galaxy S6 Edge. 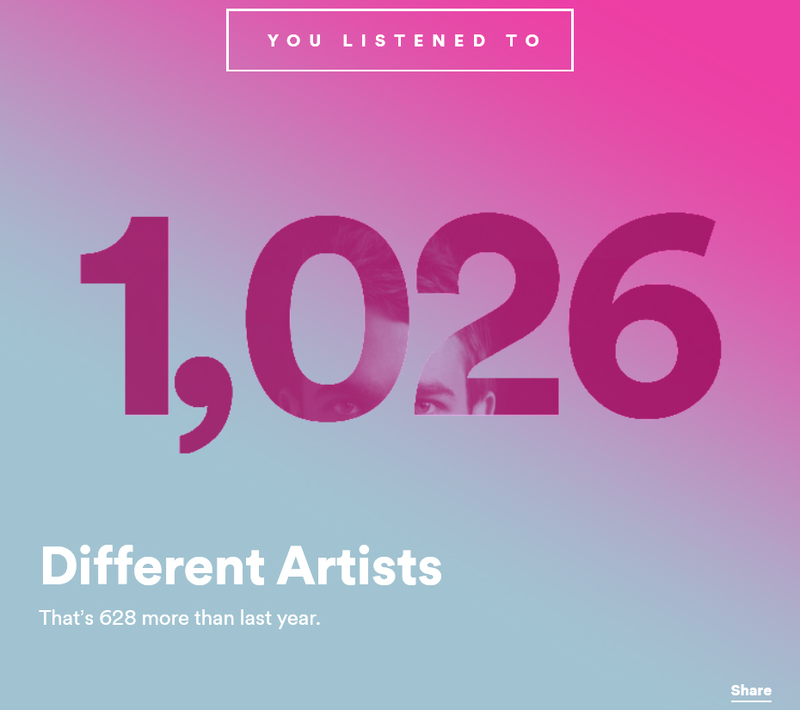 1026 different artists I’ve been listening too. And for my taste: It’s quite a lot compared to 2007 when I only listened to Britney Spears. The differance is real. 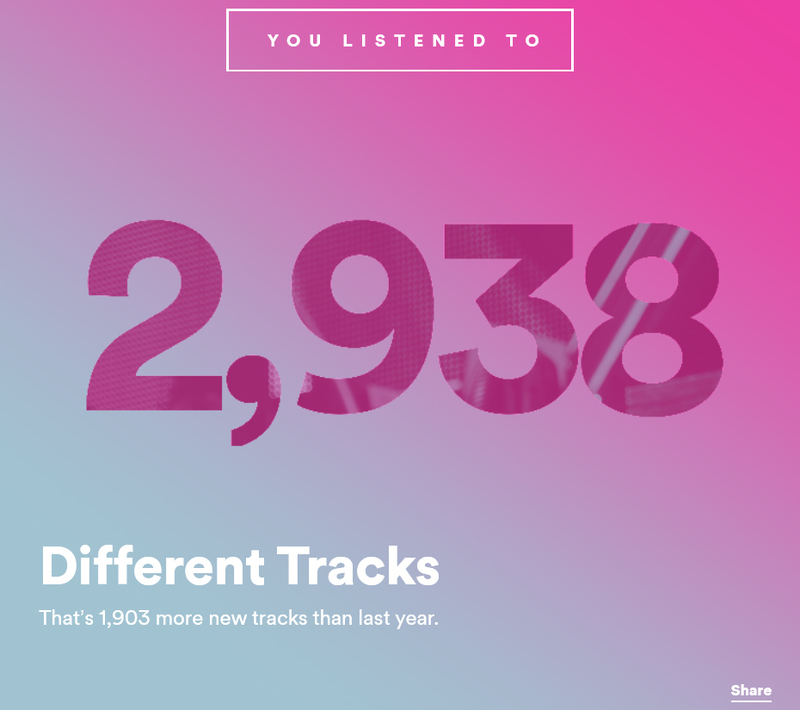 and I’ve listened to 2938 different tracks. In the beginning of 2015 I’ve listened a lot Britney, Zedd and Olly Murs. 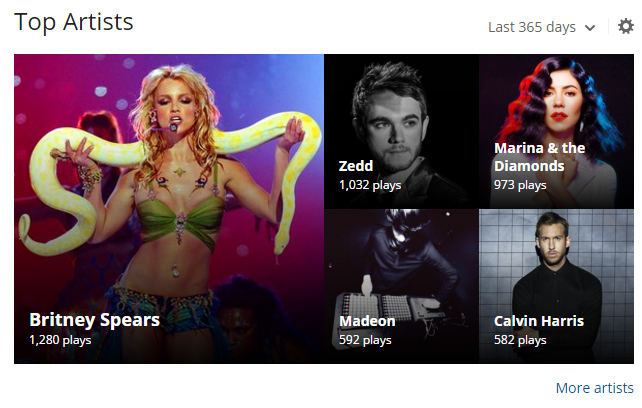 In the spring I listened once again Zedd, Britney, and then Madeon. In the summer, Britney was not there, instead Giorgio Moroder replaced her, thanks to Tom’s Diner to be honest, and then there were Zedd and Madeon. At the end of the year I listened to Gaga, Brit, and wait… Lana? Well, okay. I haven’t listened to her since her latest album Honeymoon to be honest. 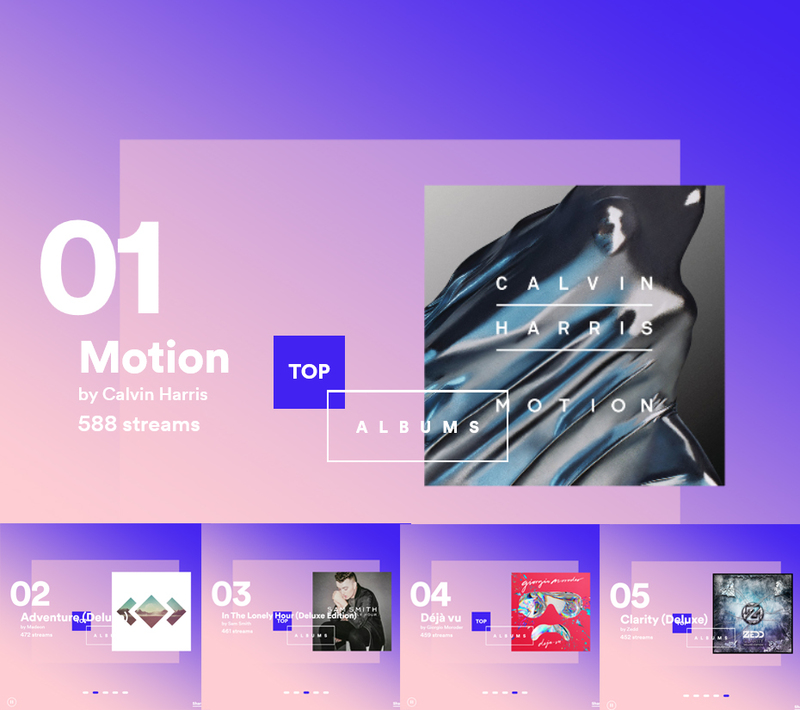 So that’s my summary of my Spotify year in music! I am really happy to be part of Spotify because I get to know many new artists like Hellberg, Isyana Sarasvati, Ella Henderson, Tinashe, Tove Lo, and mores. And I get a chance to listen to many old gems from Michael Jackson, Alanis Morissette, Anatascia, to Donna Summer. And here is my playlist of my top songs in Spotify!